Allow me to present the T-42 ‘Sugarcube’ Multiple Launch Rocket System (MLRS). 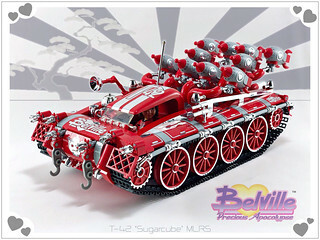 During the Belville ‘Stable Wars’ of the late 1990’s, this vehicle earned a fearsome reputation. Thanks to it’s armament of (10) ‘Heartbreaker’ rockets, the T-42 ‘Sugarcube’ packed quite a punch. 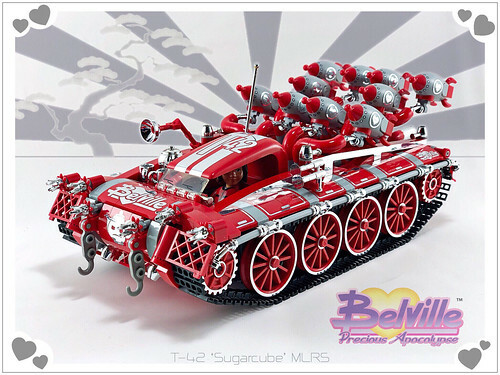 Whenever this devastating vehicle was on the battlefield, the impressive firepower and on-board tea service never failed to rally the troops to victory!